Okay, that may be a bit of an exaggeration, but this Nicaraguan puro has been known to pack a wallop. The cigar’s name pokes fun at Saka’s “Spanglish,” with the proper term (todos LOS días) translating to mean “all the days.” Story goes, in the early 2000s, Saka was given an incredibly strong cigar by Estello Padrón; when asked if he truly smokes such a strong cigar, Padrón responded, “Todos los días Saka, todos los días.” This translates to, “Every day Saka, every day.” Saka misheard Padrón and set out to one day name an extremely powerful cigar “Todos Las Dias,” not realizing he’d misspelled the phrase for nearly 15 years. 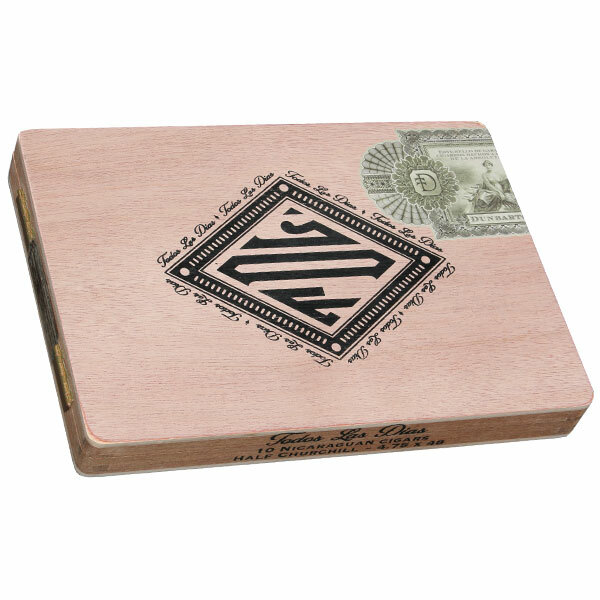 Todos Las Dias is the strongest cigar to date from Dunbarton, using a high-priming, Nicaraguan puro blend that showcases Jalapa and Estelíano tobaccos in the filler, a Nicaraguan binder, and a Cuban-seed, Nicaraguan wrapper. This blend has been specially chosen to highlight the fiery, bold qualities of Nicaragua’s intense, volcanic soil. And Steve has specifically blended TLD to begin on the mellow side—slowly ramping up to the Nicaraguan powerhouse experience that diehard, experienced smokers crave! This is the complete reversal from the usual blending style of starting with a bang before mellowing in the later portions of the smoke.